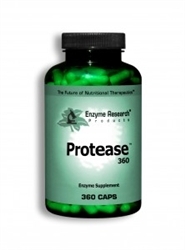 Protease taken between meals may be beneficial in cases of infection, fever, inflammation, lowered immune response, hypoglycemia, PMS, osteoporosis, candida, acne, cold/flu and acute traumatic injuries. Three (3) capsules immediately upon rising and three (3) just before bed or between meals on an empty stomach (2) hours after a meal or 1 hour before eating), or as directed by a healthcare professional. Vegetarian capsule (Hydroxypropylmethylcellulose and water), and L-Leucine. Excellent product, ease of purchase, fantastic business demeanor! Highly recommend and a lifetime customer! I am working on clearing out effects of EBV and a sluggish lymphatic system. I take these twice a day - they work as a janitor of your blood.